Hi lovelies! 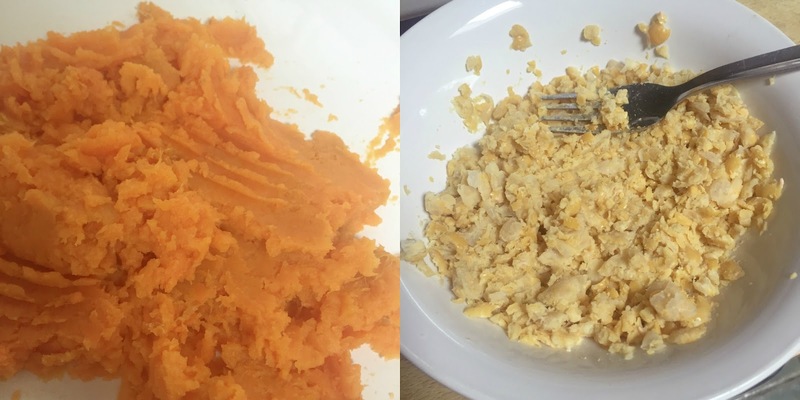 Today, I thought I'd share yet another recipe with you all! This one is vegan, but you could adapt it by adding meat or cheese if you prefer. I do suggest you try it as it is though, as it's super yummy! So, I don't really have a name for this one, as you can see from the title, but essentially, it's a Tomato based Spaghetti dish, which (almost) everyone tends to love, but with a little bit of a twist to make it more interesting and dinner party appropriate! Or at least great to cook when your parents come over if you want to look like you've put a lot of time and effort into an actually very easy meal! So, let's get right into it without too much rambling! 1. While boiling the Spaghetti, take the half tin of chickpeas, and either microwave in a microwavable bowl, or boil in a separate pot to soften. While these are both cooking, chop your olives into slices. This is optional, but I strongly recommend it, as the smaller pieces mean each mouthful isn't overwhelmed by the strong olive taste. Smaller pieces mean you get a little piece in each forkful, which adds a lot of taste and texture. 2. 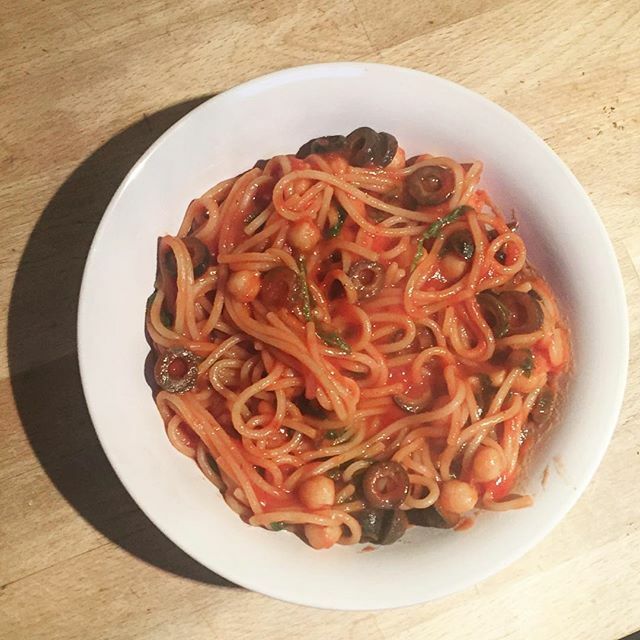 When the spaghetti is cooked, drain and put in back into the pot with the drained chickpeas and sliced olives. Pour over the Passata. 3. Add your herbs and spices to taste and crumble in the stock cube. Do all this before adding the rocket to prevent overcooking it. 4. Add the rocket once everything else is well combined, how much you cook this entirely up to you, but as you can see from my photo, it really shrinks down when cooking, so if you like it to still have a bit of crunch, you'll literally only need a couple of minutes for this. That's literally it! You can of course adapt the recipe to your tastes, but this is a seriously quick, easy dish with lots of amazing health benefits. Black olives are full of antioxidants, dietary fibre and heart healthy fats that promote healthy digestion and can help in the prevention of cardiovascular disease. The rocket is a great source of essential vitamins and minerals, including vitamin A, B vitamins, vitamin C and iron. The chickpeas are a fab meat free source of protein and are a great source of fibre, helping you feel fuller for longer. And of course, pasta provides carbs, which your body needs to function! Whole-wheat pasta would of course have more benefits, but we didn't have any and whatever you prefer is fine! So that's it! How easy is that? Let me know what you think and definitely tag me on instagram @chloesway if you make this! Hi lovelies! I'm super excited about this review I'm writing for you all today, because it's a new brand (to me at least!) that I'm already obsessing over. 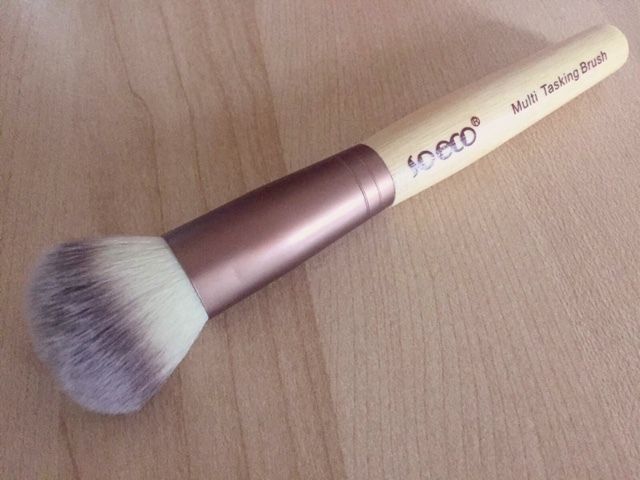 Today, I want to talk to you about the gorgeous 'So Eco' brushes. 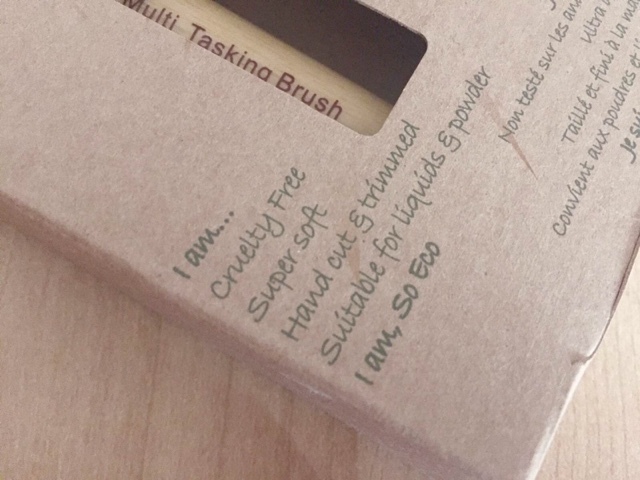 I was asked by the lovely people at MakeupBrushes.co.uk if I'd like to review a brush from the brand and as you'll likely know, I'm always up for trying new products, however when I read into this brand and found out they were an entirely cruelty free, Eco friendly brand (clue's in the name! ), which is something I'm really trying to focus on in my life at the moment, I was even more convinced that I had to give them a go! As I said, I've decided recently to try as hard as I can to buy products that don't test on animals, don't contain animal products and where possible are sustainable and Eco friendly. So naturally, 'So Eco' fit the bill perfectly! 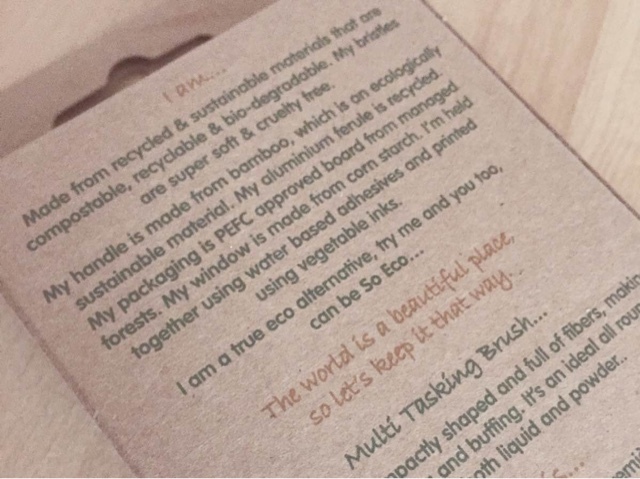 As you'll see from the packaging in the pictures, everything about the brand is environmentally friendly and animal friendly. The brand is cruelty free from the product to the packaging! 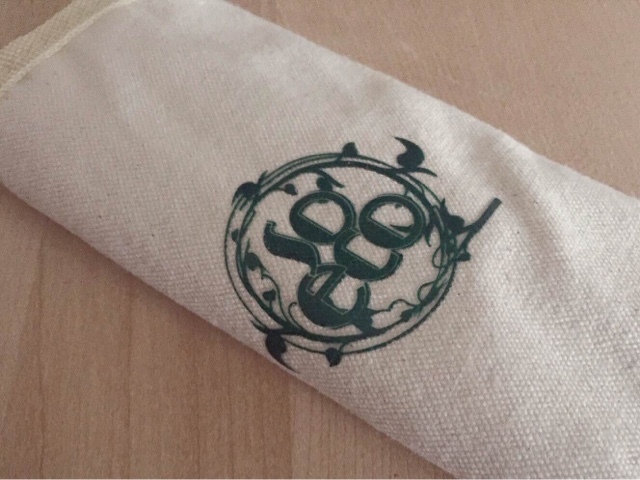 The packaging is made from sustainable, biodegradable materials that are ethically sourced, it is printed using vegetable inks, the Windows are made from compostable corn starch as opposed to hard to break down plastics and they are stuck using solvent free, water based adhesives. They also use fairly minimal packaging, avoiding waste as much as possible. And if that's not enough for you, the brushes themselves are just as Eco friendly as the packaging! 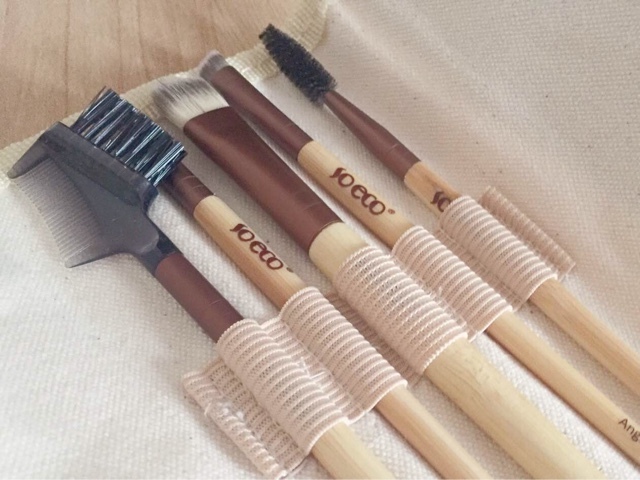 The brush handles are made from bamboo from sustainable sources and the aluminium ferrules are recycled and the bristles are made from cruelty free taklon, they also use natural, unbleached cotton bags to store the brush kits. Being so environmentally friendly though, you may expect the quality of the brushes to perhaps be slightly compromised. You'd be wrong! The brush heads have all been tested for size, application and finish, the bristle colours have been carefully chosen so you can see exactly how much product you are using - again, preventing waste, the weight and handles are custom made for optimal weight and grip and the brushes are super soft and gentle on your skin. I personally have been obsessed with these brushes and the few I've tried have absolutely made me want to try more! The brush I chose to try was the 'Multi Tasking Brush' as I thought it looked fab for buffing on foundation. I can genuinely say I much prefer this already to my higher end buffing brushes. I've found that this seems to distribute the product very evenly over your face without soaking up the liquid foundation, once again, preventing waste while creating a gorgeous, even finish. 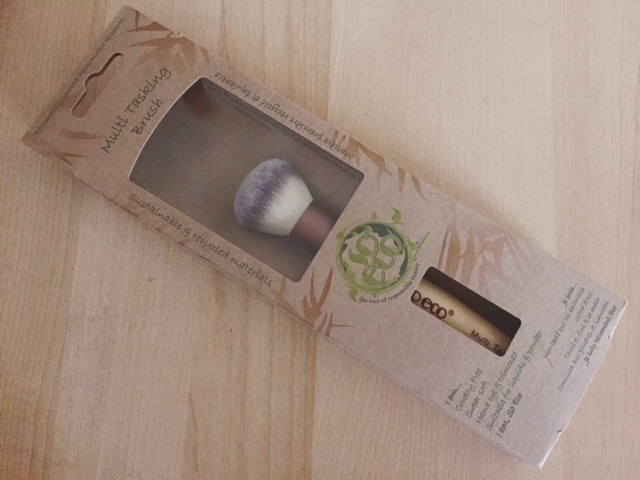 At just £7.50, this is also significantly cheaper than a lot of high end makeup brushes and the quality is not only just as good if not better, but I feel good knowing what I'm using is also sustainable and cruelty free. I was also sent the eye brush kit as a little extra so I thought I'd also give a quick overview on these. First of all, I love the cute little brush roll their in, it makes them really easy to find and handy to travel with! All of them do the job they're supposed to do very well but I've particularly loved using the shading brush - which is the largest in the pouch - for concealer and eyelid primer. Once again, it doesn't soak up loads of product, so you're getting full use out of your products and it applies my concealer and primer so evenly and smoothly without a brush stroke mark in sight! This little kit is just £12.50, which for 5 brushes of this quality is an absolutely steal in my opinion. So, I hope this proves that environmentally friendly, cruelty free products don't have to break the bank, nor do they have to compromise on quality! I will 100% be building my collection of So Eco brushes soon, seriously impressed! If you'd like to give them a go, makeupbrushes.co.uk is also offering FREE first class delivery with every order when you spend £15, so it's even more of a bargain! Let me know your thoughts! I'm loving finding environmentally friendly, cruelty free brands right now, so any suggestions would be hugely appreciated! Hi lovelies! Another foodie post for you all today, recently, Darren and I have been eating a predominately vegan diet. We chose to do this mainly for health reasons, as meat and other animal products tend not to be the best for your health, but also because for me at least, I tend to prefer vegetarian or vegan food and I love experimenting with different recipes. Whether or not I'll go fully vegan in the future I'm not 100% sure but I do definitely intend on continuing to eat vegan the majority of the time and minimise the amount of animal products I use not only in cooking, but in beauty products as well. My full list of reasons for switching to this lifestyle is a whole other post, so for today, I'm going to stick to the topic of being vegan on a budget. Like most people, I love to save money, I don't like paying over the odds for anything, especially food! However, like many people, I was under the impression that a vegan diet was expensive, at least more so than what we used to buy. However I couldn't have been more wrong! Almond Milk - I've heard some Aldi's do do this though! Soy 'Cheese' - I get Tesco's own brand for this, I don't eat much cheese usually but I put this on a pizza recently and you'd never have known the difference. Tinned Lentils - Aldi do have a lot of tinned food and they do have dry lentils, so again, check your local store, but I have to go to Tesco or Sainsbury's if I want these. Dates - There was a section for these in our store until recently, but they seem to have stopped doing them - boo! Cous cous - I may just not have been looking hard enough but I cannot for the life of me find cous cous in Aldi! Let me know if you have and which aisle you found it in if so! 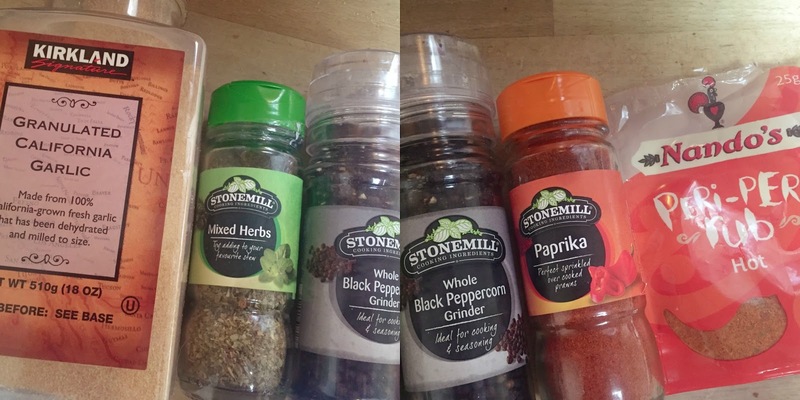 Spices - Aldi do stock some spices, but you may need to try other supermarkets for others. With the things you can't get out of the way, let's get onto the long list of things you can! I love to stock up on essential staple items at Aldi around once a month so this includes rice, pasta, oats, canned beans, canned chickpeas, sauces (pasta, chilli, curry etc), tinned tomatoes, frozen fruit, frozen veg, bread (which I tend to freeze and use when I need it) and, nuts, dried fruit and dark chocolate (yes this is an essential in our house!). These are all things with a long shelf life, or that you can freeze and keep for a long time. These basic items will mean you'll pretty much always have something ready to go for meals even if you haven't done a full food shop in the week. Bonus - almost everything I listed here excluding the nuts and dried fruit is always under £1 - bargain! As for weekly shops, we tend to do 'top up' shops consisting of lots of fresh fruit and veg, hummus, frozen veggie burgers for lazy nights, pitta breads, treats (so many of their crisps and biscuits are vegan so it's worth a look!) and then any little extras we may need. Sometimes these weekly shops can be as little as £15 or below, depending on how much we already have in the house. 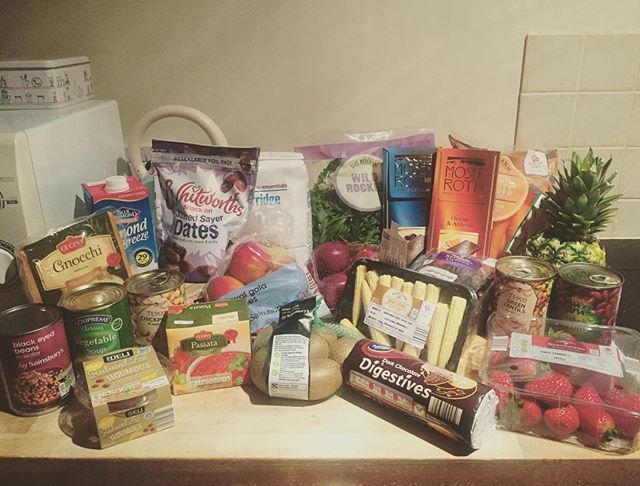 Incase you need a bit of inspiration or don't really know where to start with a vegan diet, I'm going to suggest a few of my Aldi staples and how I use them. Porridge Oats - these are 75p for a huge bag (I'm pretty sure it's a 1KG bag! ), I prepare overnight oats with these every single night using 50g oats, 100ml almond milk, some frozen blueberries and a little maple syrup. It's a super simple, incredibly cheap breakfast and it tastes so good! Canned Beans - My Aldi does a few types of canned beans such as Kidney Beans, Butter beans, chickpeas etc, the Red Kidney Beans are just 23p per can! I use these as a meat substitute when making things like chilli or bolognese. There also fab when made into bean burgers with sweet potato - I may save this recipe for another post! Pasta, Chilli, Curry and Bolognese Sauces - These sauces are fab for when you can't be bothered to make your own or just want to make something super quick. Many of their sauces are vegan but you will need to double check, particularly with curry sauces. These aren't the best for you in terms of added ingredients so I would watch that if you're worried about additives or sodium it they're mostly pretty good. These are all generally around £1 or less too. Pasta, Rice and Spaghetti - These are such great bases for meals and they're dirt cheap too! Aldi doesn't always carry brown or wholewheat versions so stock up if you spot them. Produce - Fruit and Veggies! Aldi's selection of fruit and veg is fantastic and they also stock some organic which is fab if you're concerned about that. What's also great is they always have a weekly 'Super Six' offer where six fruits and veggies are reduced dramatically. They also have daily deals so you'll have to check those out whenever you go! Pitta breads - We tend to eat pitta bread more than we do regular bread just because we prefer it and Aldi always have 6 wholewheat pitta breads for just 47p! I'll often buy a couple of packets and freeze them as these freeze really well. I hope this has given you some insight into how to live a little healthier while saving money and I hope it proves that a healthy diet does not have to cost the earth! Let me know what you think and if you'd like to see more posts like this, perhaps some more recipes or food shopping hauls? Share your thoughts in the comments! And if you have any healthy food posts on your blog right now, leave them in the comments as I'm obsessed with reading this sort of thing at the moment! Another thing Aldi is fab for is vegan treats, there's not the biggest selection, but the things they do have are fab! One of my favourites is their Dark Chocolate Digestives, it is so hard to find these anywhere else without dairy in the ingredients, but Aldi have done it! These along with some of the other items I'm going to list are often made in factories that handle milk products they cannot actually guarantee no milk, but there is none listed on the ingredients, so you'll have to make up your own mind on how you feel about that. Another favourite of mine is the Moser Roth Dark Chocolate range, our favourites are the Sea Salt and Orange and Almond bars. These are in no way good for you, but for me it's important to have little treats now and then in your diet and these are a yummy one and just over £1 for 5 individually wrapped bars! Not necessarily a treat, but Aldi do their own branded Gnocchi which I love and bonus, it doesn't contain any egg like a lot of Gnocchi does, this is amazing with a spicy pasta sauce as a seriously quick meal - fab after a long day at work! Finally, we also often buy their 'Passions' crisps in Salt & Vinegar, these particular ones are definitely vegan but I'm not sure about other flavours. These are like Kettle Chips but better and only 69p! I think I'll leave this here for now as this post is getting seriously long, so congrats if you made it to the end! From the prettiest pastels to the most dashing designs, this spring we’re inspired by some of the season's key looks for homes. 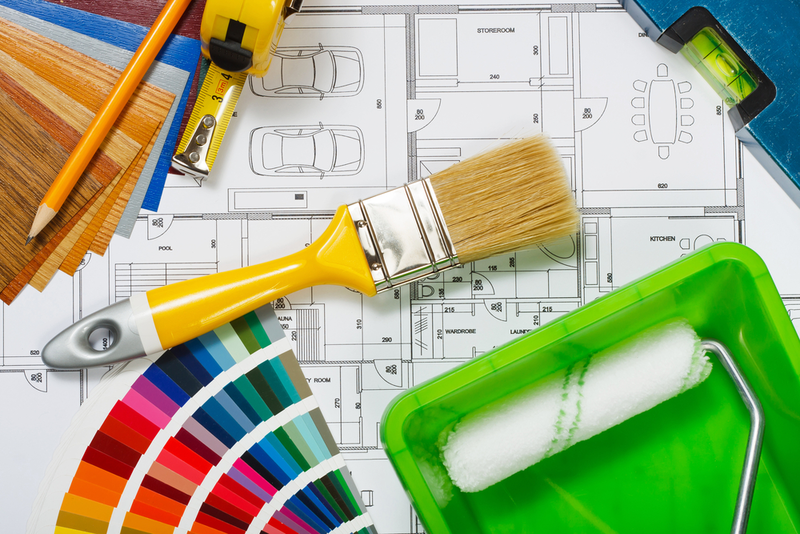 If you’re looking to liven up your living space with a fresh new look or perhaps you’re a dab hand at decorating and would like to put your polished painting skills to good use, we have the hottest trends for you right here! Depending on where you live, you may already be enjoying the fresh sights and sounds of spring, as the winter chill starts to feel like a distant memory. It is indeed a welcome change for the most of us, with bird song filling the air and fresh blossoms adding colour to our lives. It’s time for new beginnings and for us homeowners, nothing spells a change of season quite like a home makeover. 1) Pop of colour. Just like the switch between your winter and spring wardrobe, it’s time for your home to shed its wintery whites and step into a more colourful world of brighter tones. For the summer, we notice a shift towards warmer, richer and deeper colours in our homes. Pink is making a return and we’re not talking about the barbie and bubblegum shades famous with teens the world over - oh no! This season, dusty/pastel shades are back and we’re loving the warmth it brings to otherwise bland walls. 2) Themes. It seems recycling trends from different decades adds a funky feel to your space as homeowners experiment with a truly stand-out collection of designer interiors. Fashion and trends are on a constant cycle that will come back around when you least expect it. Having different themes around your home will reflect your unique personality but having one strong design will make a bold statement - so you can work it both ways! 3) Statement accessories. If you want to maximise the appearance of your space, then a statement piece is going to be a must and for spring/summer 2016. It’s all about bringing some interest to a large space on your walls. There’s a great range of wall art on the market for homeowners looking for new ways to impress guests with a real sense of style and glamour. From the ornate to the simple, contemporary to the classic, there are a number of designs for you to choose from. 4) Rustic interiors. Decorating with natural materials has become increasingly popular in recent years, which explains the surge of sales in rustic home interiors. Whether you’re looking for the original farmhouse feel or would just like to add a few unique touches here and there, rustic interiors are the perfect way to give any space a traditional twist and present a relaxed atmosphere. 5) Exotic prints. These contemporary styles have been making waves in homes across the UK for some years now, but this spring you can expect to see more exotic prints. As the world gears up for the excitement of Rio 2016 this August, expect to see an injection of Brazilian prints including jungle-themed home decor! To get this look for yourself, fill your home with tropical plants, jungle inspired furnishings and clashing colours, such as oranges, yellows and greens. This article was provided by Home Flair Decor, who specialise in the finest, luxury home interiors for their customers.